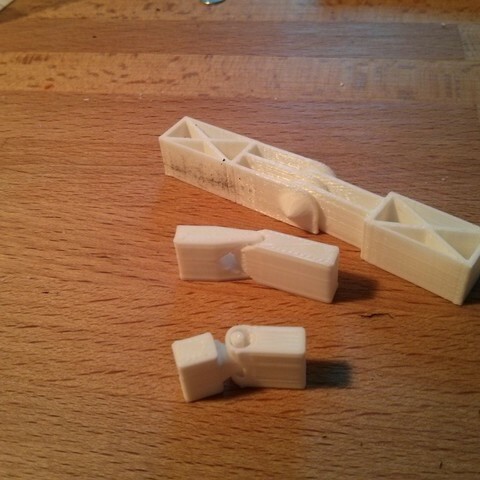 This OpenSCAD library generates three different types of print-in-place hinges. All of the hinges can be printed fully assembled without support materials. One hinge type has a horizontal hinge axis, and the other two hinge types have vertical hinge axes. The hinge models are parameterized so that the size and clearances may be adjusted. In my experience, if there is a gap between adjacent hinge fingers when printing the first few layers, then the clearance parameter value is large enough. If you start printing and the hinge fingers overlap in the first layer, cancel the print and increase the hinge spacing value. but I wrote my version from scratch to give more control over the spacing and distribution of hinge arms. The two vertical hinges are my own designs. //UPDATED 11/8/13 - Added separate stl files for each example hinge type. Download the OpenSCAD file and use it in your own designs.